The Lunar World Record represents a group of amateur astronomers with Celestron reflector telescopes to make a photographic image of the moon. Using sct telescopes and Lumenera and Imaging Source DMK astronomical imaging ccd cameras similar to webcams for astronomy imaging. 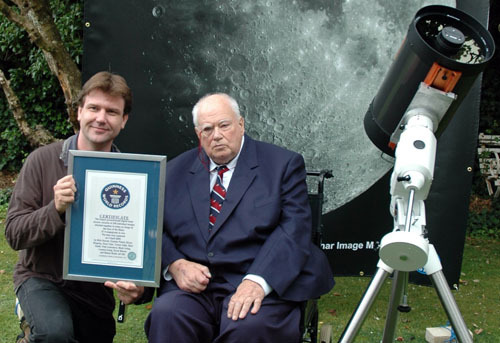 The event took place in the garden of Sir Patrick Moore by his astronomical observatory. Download the image and donate to the Cystic Fibrosis Trust! We are raising money for Sir Patrick Moore's chosen charity, the Cystic Fibrosis Trust. All monies donated will go directly to the charity, as our time is given for free. An incredibly ambitious project to create the largest ground-based mosaic image of the Moon, and enter the Guinness Book of Records, has finally delivered a staggering final shot. A team of people, comprising of some of the world's foremost astro imagers, gathered at the home of Sir Patrick Moore in April this year. 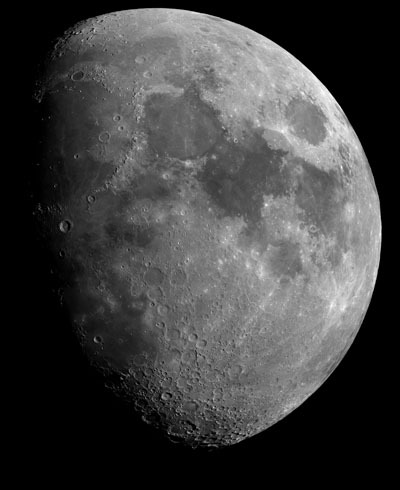 Using specialist astronomy cameras with high-end amateur telescopes and special software to compile and mosaic the frames, they have created an image which has eclipsed any other so far taken of the Moon by ground-based astronomers. The aim was to image the Moon at very high focal lengths using high frame-rate planetary cameras attached to numerous large amateur telescopes. Each telescope would take an image of a small section of the lunar surface at high resolution and these would be assembled, like a giant jigsaw puzzle, into a complete image of the 9-day old Moon. The team submitted close to 1000 panes from the individual image runs, with close to 1.2 million frames of video captured, totalling 1.1 terabytes of data. These image panes were individually stitched by each team member who then submitted their region to David Mason for final compositing into the final image. The images which make up the final master were selected based on their overall quality. A significant amount of overlap was used. In total, the image shown here utilises a total of 288 high resolution panes. The end result is a high resolution 87.4 megapixel image of the Moon, larger even then previous images taken by some of the world's largest observatories, allowing features as small as 1km to be clearly seen. The imaging team saw the likes of Damian Peach, Pete Lawrence, Dave Tyler, Bruce Kingsley, Nick Smith, and more, work in sync on assigned segments of the Moon from Sir Patrick Moore's Selsey home and locations around the UK. "This is a monumental image, worthy of the International Year of Astronomy 2009, and our way of honouring Sir Patrick's incredible work in mapping the Moon for the Russian and American Moon missions in the 1960s, on this, the 40th anniversary of the Apollo 11 landing", says Nick Howes, who is part of the imaging team, and came up with the original plan for the record attempt. "To have secured, and been successful with such an immense pool of imaging talent for this is a real thrill, and to be allowed to attempt it from Sir Patrick's garden only added to the excitement. "This was a huge team effort with every single person playing a vital part", continues Nick, "additional imaging was done by Trevor Little, with David Mason, Mark Irving and Lea Irving working on other aspects of the imaging at lower focal ratios, which provided invaluable backup to the image. Special mention must go to David Mason for his amazing work on compositing the whole lot together, as even though the team were using similar equipment, differences in seeing and camera orientation made stitching the 425MB final image in Photoshop a real challenge." Ninian Boyle, of Venturescope, and a regular contributor to Sky at Night Magazine, coordinated the team in Selsey on the night, and gave invaluable technical assistance throughout. Guinness World Records presented the team with their certificate at an event hosted by Sir Patrick Moore on July 11th 2009. The image was unveiled in printed form for the first time, and everyone present was able to examine the 2.5-metre high print. At the same event, Sir Patrick received his own certificate to recognise his world record as the longest running television presenter of the BBC Sky at Night programme. All proceeds from the use of the final image, which is already being mooted for use at various planetariums around the UK, and which will be available to view and purchase from this website, will be donated to the Cystic Fibrosis Trust, a charity designated by Sir Patrick, with all team members contributing their time for free.